Here at Brooklynn, I offer full conformation showing, grooming, training and boarding for Yorkshire Terriers and other Toy Breeds. All yorkies live in my house during their stay with me. I attend many shows in the TX, LA, and OK areas. 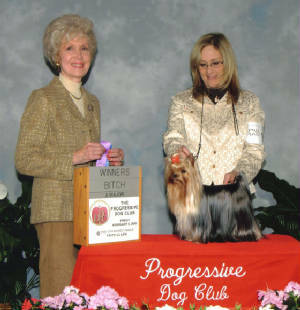 I attend some regional and national specialties shows for Yorkshire Terriers . I also attend Westminister, Progressive ToyDog Club, and Specialty shows in Feb in New York City. I live in Midlothian, Texas. Call for more information on my Handling Contract and Rates.